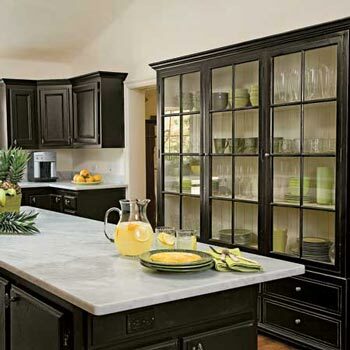 Cabinet doors are one of the most important design issues when it comes to choosing your kitchen cabinetry. Kitchen cabinet doors are so important they have the power to make or break the look of any kitchen. Whether it’s a complete remodel or just an update by changing cabinet doors, the choices are limitless. Laminate. This is a very popular, inexpensive, durable and easy to keep clean cabinet door surface. With countless styles and colors to choose from, the design of this surface is only hindered by your imagination. Wood. You can either go with a veneer surface or they can be all wood. If choosing a wood door, you need to consider how the end product will look, such as the use of stains and the type of grain (open or closed). Paint. These days, the range of paint on offer is staggering. Perhaps one of the most common types of paint for cabinet doors at the moment is that of polyurethane. This finish provides high gloss and is very modern. Aluminum. This also gives a modern look. These cabinet doors are also inset with different materials, such as clear, frosted or mirrored glass. The aluminum you choose from can also have different finishes, such as satin or brushed. Style. Cabinet doors can be either flat or routered. Two basic styles of doors are the raised panel and the recessed panel door. Both are, as the name suggests, with a raised center panel or a recessed center panel. There are also different types of patterns, such roman arch or capri. Color. Of course this will depend upon the rest of your kitchen. What’s the feeling or style you’re trying to achieve. Go and visit a kitchen showroom, or, if possible, get a sample and take it home to test. Choosing your kitchen cabinet doors is a large component of the overall look of the kitchen. When choosing kitchen cabinet doors in your Outer Banks home, ask for information and advice from Custom Kitchens. With over five decades of experience in kitchen cabinetry, Outer Banks Custom Kitchens possesses a wealth of knowledge when it comes to all things kitchen cabinets.